Simon Periton's permanent commission for the D-shaped lawn at Firstsite was launched soon after the gallery opened in 2011. 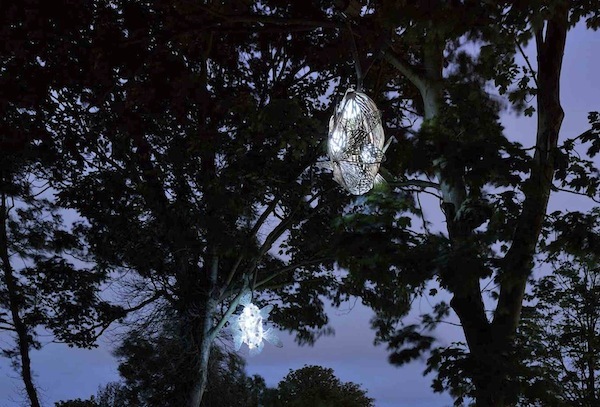 The artwork, entitled Bombyx Mori, is a four-part installation made up of three lanterns and a lamppost. Ova, Larva, and Pupa are names the artist has given to the lanterns, and Polaris refers to the lamppost. The lanterns are suspended from the magical arc of trees in the garden; the lamppost sits at the end of this arc, acting as a punctuation mark and meeting point. Simon researched the garden's eighteenth-century design in collaboration with the landscape architects, to create planting for the new building. The commission stems in part from the history of the site; there is a long-established mulberry tree in the gardens of East Hill House opposite firstsite, and the worms of the silk moths that appear in the artwork were essential to domestic silk production in nineteenth-century Colchester. I worked with Simon and other firstsite staff members on the commission. I edited a book on the project which is designed by Simon Josebury and includes an interview with Simon Periton and myself.